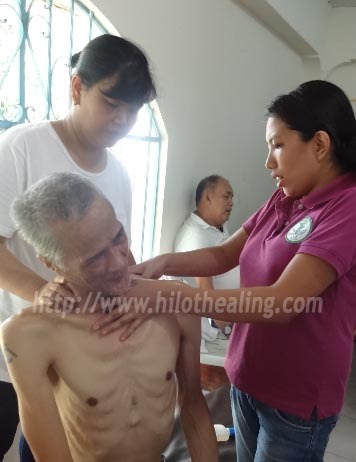 ATHAG’s therapists ease muscle and joint pains with traditional HIlot. 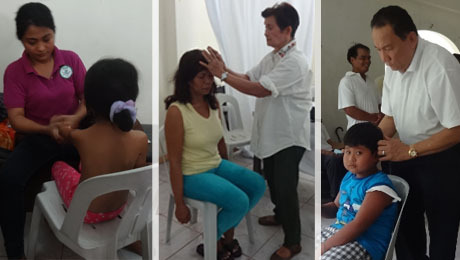 BAMBAN, Tarlac- The manghihilot and staff of ATHAG, led by their president and resident albularyo Dr. Bibiano “Boy” Fajardo, joined the United Healers League of the Philippines, Inc. (UHLPI) during its Healing Festival 2014 held at the Rofil Compound on August 2, 2014. The Healing Festival was initiated by the UHLPI’s Council for Kuranderos, with the cooperation of UHLPI’s Council for Hilot, in partnership with Union Espiritista Cristiana de Filipinas, Inc. (UECFI) Regions 7, 7A, 17, and 17A and ATHAG. The Healing Festival 2014 is UHLPI’s way of showing support to the Traditional and Alternative Medicine Act of 1997 and the government’s initiatives toward universal health care. Side by side: A classic ‘Kurandero,’ Mr. Joey Guttierez, and a modern Doctor of Alternative Medicine, Dr. Mary Jean Acero. An estimated 250-300 UECFI members and guests came to participate in the whole day activity and avail of the free consultation, treatment sessions, and health lectures provided at the Healing Festival by Dr. Christian Emmanuel V. Mancao (immediate relief myotherapy), Dr. Bibiano Fajardo (Hilot) Dr. Mary Jean Acero (alternative medicine), Prof. Claudette Rosal (Color Therapy), and UECFI’s own dedicated spiritual healers, headed by Mr. Joey Guttierez. Each healing modality/group was assigned a space in the center, where they performed consultation, counselling, healing, and treatment sessions. After registering at the entrance, members and guests were called by batches so they could be served by their chosen healers. 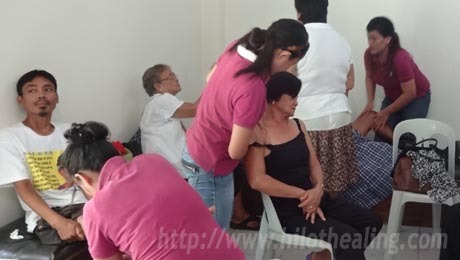 The five ATHAG therapists (manghihilot) at the activity—namely Karisse Alzola, Karen Reyes, Marife Merlin, Jhen Dellosa, and Jane Alzola, together with secretary Emmie Rebudal—had their hands full catering to over forty people who came in for traditional Hilot treatment. Hilot advocates Alex Candaza and Lope Tadios Jr. were also on hand to provide assistance and advice. Most of ATHAG’s share of patients at the Healing Festival complained of various bodily aches and pains. Many were suffering from pains and/or numbness in the feet, knees, hands, back, and neck. Some had frozen shoulders and gout. Others had chronic conditions such as prostrate problems and headaches. 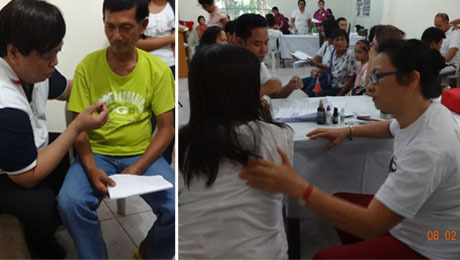 One of those who availed of free Hilot treatment was 61-year-old Jose M. Abuy, a former PAF Master Sergeant who was discharged from the service in 2006 due to disability. According to him, he had figured in a vehicular accident where his head crashed against the windshield. A week after it happened, he noticed he was blinking rapidly and involuntarily. He first sought an EENT specialist, who in turn referred him to a neurologist. At the V. Luna General Hospital, Jose was diagnosed as having dystonia, a disorder that causes muscles to contract for extended periods, causing repetitious movements or abnormal postures. Karen Reyes, the manghihilot, explains how to do Hilot at home. During his Hilot session, the manghihilot (Karen Reyes) focused on the muscles in his neck, shoulders, and back. Afterwards, she also taught his wife on how to do Hilot so she could help relax his muscles at home. Nais ko pong magpasalamat sa patuloy nyong pag update sa akin. Next na uwi kop o ay sa april 2015 pa. Puede po bang malaman kung paano ang aking gagawin para makapag set up ng ATHAG sa aming lugar sa Bayambang, Pangasinan. Magkano p kaya ang capital outlay para makapag umpisa ng franchise ng ATHAG at kung ano ano ang mga kailangan. Noon, ang balak ko sana, yung high school batch naming ang amg manage ng branch ng ATHAG at itrain yung mga kabatch naming na nangangailangan ng training at sila ang magiging certified na manghihilot, pero ngayun the same pa rin ag balak pero instead na ang batch naming e ako na lang ang mamuhunan. Puede pong tulungan nyo ako? Maraming salamat po sa kagustuhan niyong magkaroon ng Hilot center at sa pagtulong sa inyong mga kababayan. Sa kasalukuyan po ay ginagawa pa po namin ang plano na maaring gawin sa mga komunidad, lalo na sa mga probinsiya. Maraming salamat po ulit at ingat po kayo diyan!